As I was struggling yet again with my children's bad behavior & lack of respect, a thought struck me & I was immediately humbled for my foolishness. God reminded me that children are similar to a garden. Just as we ready a garden for its new plants, there are things we must do to prepare a child in this world. We want to secure the tender plants in the rich dirt deep enough for its roots to take hold, but not so deep that it will be smothered. We need to water the plants the right amounts & at the right time. Too little water & they will thirst & die. Too much water, they will be swamped & not survive. If we water in the heat of the day, they will become scorched & shrivel up. Sometimes stakes or twine are needed to help the flimsy plants grow tall. 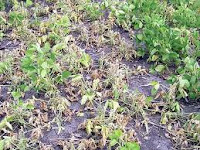 Continuous tending is needed to ensure the plant is not overtaken by strange weeds. Occasional fertilization is necessary to a slow plant. Don't forget the scarecrow to ward off hungry scavengers. Before long, with lots of love you will have a garden that will give back to you just as you gave to it. We experience every emotion imaginable as we prepare for the new little lives that will soon be entrusted to us, whether by pregnancy, adoption, or foster care. We are excited about the new adventure we are facing. We fear for their safety. We take pride in wondering what their future holds. We hurt because we know that one day they will hurt. Above all else, we love unconditionally. When they are young, we teach them our beliefs & values. We share our hopes & dreams. We nurture them continually trying to make them into solid, moral, trustworthy, respectable young people. We hold their hands through both joyous & sad times. We pick them up & dust them off when they stumble on the path. We reassure them through difficult decisions. We try to shield them from the evils of the world. We watch out for their mistakes & help them learn from them. We detour them from bad influences & wrong choices. We help them stand up for their own convictions. We help them carry their own burdens. We encourage them to pursue their own dreams. We stand guard against bad dreams. We stand guard against untrustworthy people. We stand guard against harmful situations. We stand guard because they are watching us! Any plant can grow & produce fruit for a little while. But if its left alone, if its neglected, if it has to fight too long for survival - it will fail! Before long, there isn't enough water. Before long, the fruit has weighed it down. Before long, the sun has scorched it. Before long, the cold will freeze it. Before long, the bugs have infested it. Before long, the weeds have over taken it. Before long, the animals have stripped it bare. Before long, it's too late!